I’m not entirely sure these guys have thought out their business strategy. Or maybe they have? 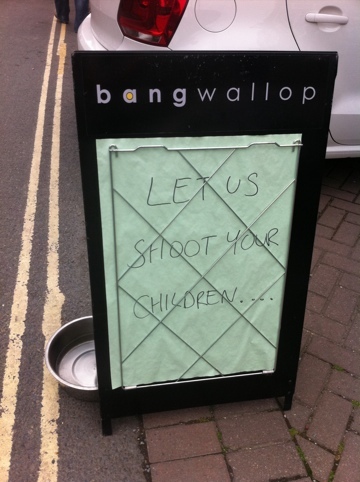 Either way I’m fairly sure that advertising the fact that you shoot children is a very unwise legal move. Pretty sure it’s still looked on unfavourably by the law. Unless I’ve mid-read this? No…impossible. somehow ‘map’ got typed instead of ‘make’ – but I guess it’s easy read though. I believe this is known colloquially as ‘hiding in plain sight’ – see, nobody would suspect a murderer to be holding a sign that says ‘It is me… I am the murderer’, likewise, when law enforcement officers and the associated press get wind of a mass shooting targeting the under-9’s, the last place they will look is bangwallop… they’ll book their own grandma’s before twigging onto this lot.